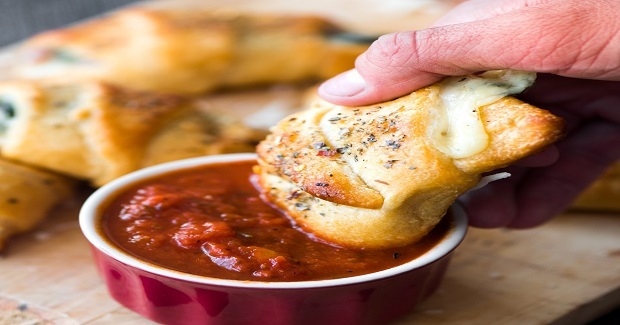 Cheesy Pizza Croissant Rollups Recipe - Gutom Na! Posted on Friday, April 22nd, 2016 at 4:14 pm. Heat the olive oil in a skillet. Add in the sausage and spinach, cooking until spinach is wilted down. Season with the garlic powder. Stir in the mozzarella and let melt. Unroll the croissant dough on a baking sheet lined with parchment paper and place a heaping tablespoon of the cheese mixture at the larger end. Roll according to the instructions on the package. Brush the dough with the butter and sprinkle with the parmesan, oregano, and red pepper flakes. Bake for 12-15 minutes until golden on top.